I have blogged about balance and priorities and health and taking good care of yourself incessantly. I guess I need to take my own advice. I got a cold last Sunday, the kind where you are achy and have a fever and basically feel miserable. 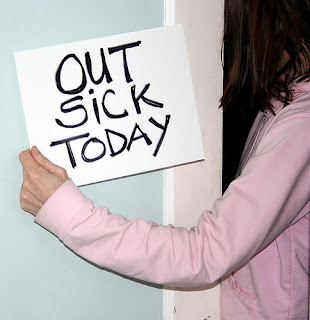 I worked sick every day, I came home sick every day, and I sleeping sick was the worst! After 6 days of this, I went back to the doctor and was diagnosed with bronchitis. That I got because I didn’t take care of my cold. I spent the weekend as a ghost of myself. I set up the guest room as my sick room and only came out a few hours here or there to basically sit quietly on the couch. I am finally on the road to recovery and almost back to 100%. Which means I’ve started analyzing and criticizing myself… Why didn’t you take a sick day? One day off might mean that you would have been well 5 days earlier! Is anything more important than your health? Are you not a priority? Is it fair that you gave everything you had every day to work and came home to be a silent, unengaged wife? You haven’t worked out in over a week! Bronchitis stinks. If you're not careful it can last up to six weeks. Listen to your body and get steriods if you have to. At least you're not 7 months pregnant, pulled a chest muscle and a stomach bug. I'll never forget that one.